Many of us like the idea of a guard dog who helps to keep the house safe. What better deterrent from criminals than a big, scary guard dog with a booming bark? But at the same time, we live busy lives. We want a guard dog who can hold down the fort while we’re gone or sleeping, but who will also happily accept family and friends in the home, cuddle with our nephews, and politely greet strangers on walks. It’s a tall order – and it’s our topic of discussion for today’s Ask a Behavior Consultant. Let’s get into it! How can you teach your dog to be friendly with strangers but protect your home while you’re not home? Let me start with a disclaimer here: I’m not a protection dog trainer. I have not trialed or competed in IPO, French Ring, or any other protection sport. I certainly haven’t trained professional protection/guard dogs. But I have a solid grasp on how dogs learn and how to teach them, and I have trained several dogs to get between their owners and an oncoming person on cue. Teach the dog to politely ignore or greet strangers. What does this look like? Maybe the dog is able to quietly walk past other people and dogs, focusing on the handler with loose body postures, soft eyes, and a relaxed tail. This might also mean that the dog approaches people and dogs with a relaxed tail, soft eyes, and loose body postures and accepts scratching. Teach the dog to bark when people approach the house and the dog is home alone. My guess is that this is what Wannabe Guard Dog wants. If they want a dog that will bite or seriously pursue the oncoming person, that’s outside my area of expertise. Carefully and specifically defining our target behavior is really important here – we need to know exactly what we’re working towards so that we can break it up into smaller steps. The challenge of #2 is teaching the dog to think through and problem-solve on his own. From the dog’s point of view, what’s the difference between a friendly dog walker and a would-be burglar? How do we teach the dog to be friendly to a dog sitter or dog walker, and ferocious to a burglar? How Do I Teach My Guard Dog to Accept Guests? 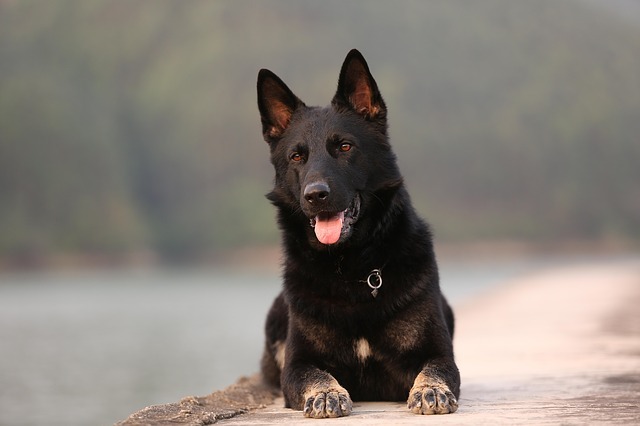 German Shepherds are genetically predisposed towards being suspicious of strangers. They’re quick to bark and are very alert to changes in their environments. Our solution might be to teach the dog a “quiet now, it’s ok” sort of cue rather than asking the dog to make a distinction on his own. We might not want the dog to assume that he should bark, only to be told to be quiet. I don’t like that plan much. But we don’t have another option, since you won’t be around to give the cue and the burglar isn’t exactly going to tell the dog that he should be driven off! My quick-fix solution for this problem would be this: teach your dog that meeting people outside is great, but people entering the home is not. Whenever you want to greet guests, take your guard dog outside with you. Put him on a leash and go for a brief walk around the block with your guests. Do this every time guests come over. If your dog is barky with strangers out and about, see our training protocol for that problem here. If you’re still having problems with meeting guests politely, check out our e-book on polite greetings. Enter the home together with your guests. Have the guests toss your dog a few treats, but ask your guests to otherwise ignore the dog unless he asks them for attention. They should toss treats behind your dog and otherwise pretend he’s not around. Give your dog a puzzle toy to work on while the guests are hanging out. When you can’t complete this protocol (say, with the mailman or an elderly relative), put your dog in a crate in a back bedroom with a puzzle toy. Play some music and leave your dog in there until the guest leaves. If you need help with this, check out our resources on crate training. This approach teaches your dog to greet people politely outdoors. It also teaches him that guests who he meets outdoors, give him food, and enter the home with you are A-OK! This is the protocol we used when we fostered an aggressive German Shepherd. She did NOT like people entering the home if she was indoors, but was friendly if she met them outside first. How Do I Teach My Dog to Protect the House From Danger? If you already own a German Shepherd (or truthfully, most dogs), odds are your dog already naturally barks at the door. For the vast majority of intruders, the loud bark of a German Shepherd will be plenty of deterrence. Unless you’re willing to work with a professional protection dog trainer, I’d suggest leaving it at barking. 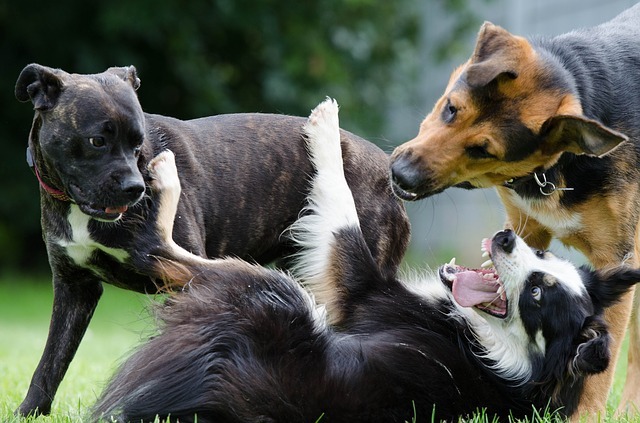 Encouraging your dog to chase, growl, or bite without the help of a highly experienced professional is a risky proposition! It’s one thing if your dog barks at a guest – not a big deal. But if your dog miscalculates and bites a guest, you could get sued and/or your dog could get seized and euthanized. This is not a joke, and protection training isn’t good for beginners or uncommitted owners. Most dogs will bark at the door and bark at guests without any additional training. If your dog doesn’t naturally bark at the door or bark at guests, I’d suggest getting help from a trainer who can help you build that behavior in a careful way. Your training plan for this will involve building up the dog’s frustration by tying him down and teasing him with something that he wants. If he barks, he gets the thing he wants. Eventually, you’ll transfer that training over to teaching him to bark when people enter the house – that’s the part that requires professional help! Again, training this on your own could lead to a dog who bites, charges, or growls at the wrong time – or just barks at EVERYONE and EVERYTHING! Not fun! A barking dog is a great deterrent. If you like your dog’s barking but want your guard dog to be friendly with guests, the trick is teaching your dog that guests outdoors are friendly, whereas people inside the house without that initial meeting are not!